The Sea and Land Surface Temperature Radiometer (SLSTR) is the fourth of the along-track scanning radiometers and is designed to maintain highly accurate SST and LST data continuity after Envisat, as part of the EU's Copernicus space segment. SLSTR was launched into a Polar, Sun-synchronous orbit from Russia on 16 February 2016, on the Sentinel 3A satellite. The development of SLSTR represents a major step forward for the ATSR sensors, as it marks the complete transition of the instrument concept from experimental scientific instrument to becoming an important element of Europe's operational infrastructure for environmental observations. Although SLSTR has a new design featuring additional channels, higher spatial resolution in some channels and a wider swath, the principle design feature originates from ATSR; a conical scanning geometry that provides two views of the earth at different view angles to enable accurate atmospheric correction. All of these features are of great scientific interest and will enable an improvement in, amongst other things, global coverage, improved cloud detection and forest fire detection. SLSTR covers 9 spectral bands (550 - 12000 nm), dual-view scan with swath widths of 1420 km (nadir) and 750 km (backwards). As it is also an operational satellite it is essential that the design is firmly based on the heritage of previous, proven designs. In order to achieve this, the Rutherford Appleton Laboratory (RAL), who had design authority for all three of the previous ATSR sensors, have a prominent role in the design, development and calibration of SLSTR, within a consortium led by Selex Galileo. 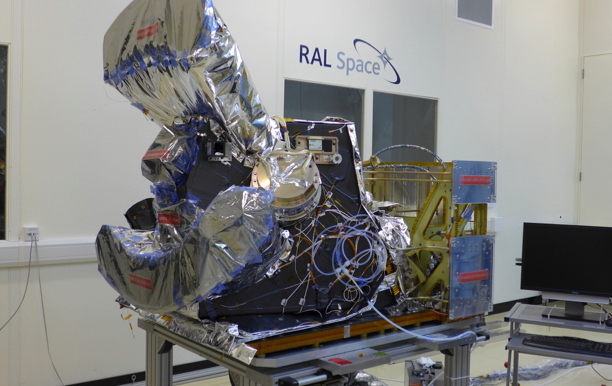 A dedicated facility has been built at RAL Space for the pre-flight calibration activities that are essential for SLSTR providing accurate and traceable measurements. ESA delivered a presentation on Sentinel 3, which includes much material about SLSTR, at the GHRSST meeting in June 2012. Click to move to ATSR-1 or ATSR-2 or AATSR.